Arizona freshman center Semaj Smith, blocking out Stanford center Shannon Coffee, was among the younger players who got some valuable experience against the No. 6 Cardinal. Arizona guard Lucia Alonso looks to pass the ball during Sunday’s game against Stanford. The Cardinal led from the start on the way to a 30-point victory. 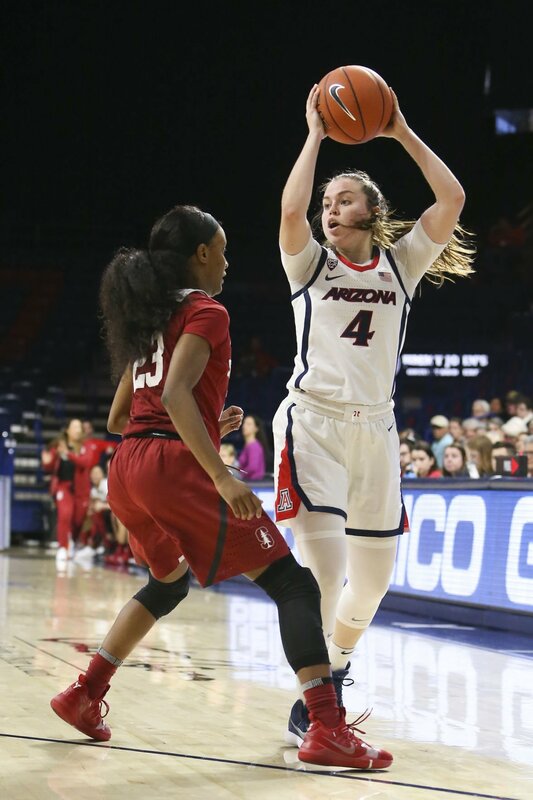 The Arizona women’s basketball team entered Sunday’s afternoon game at McKale Center against No. 6 Stanford wanting to pull another upset. After all, they took down then-ranked No. 17 Arizona State before 2018 ended and No. 24 California on Friday. But Stanford is just too good — both on offense and defense — and routed Arizona 78-48. If anything, Sunday’s loss served as a reminder: The Wildcats are still in a rebuilding season. The Cardinal got off to a quick start, scoring five points before Arizona could even get situated on the court. After a few scoreless minutes, Sam Thomas downed a three-pointer from the wing to get the Wildcats’ scoring started, but Arizona would continue to struggle. Aari McDonald, who’s averaging 26 points per game as the nation’s leading scorer, missed four three-point attempts in the first quarter. McDonald was held to 17 points on 6-of-22 shooting, a vast change from the last three consecutive 30-point games. Still, the Wildcats continued chugging, and Dominique McBryde got a crucial block as time expired in the first quarter to keep the damage to 21-12. However, the second quarter wasn’t kind to the Wildcats, who shot less than 17 percent and could score only four points. The Cardinal extended their lead to 44-16 by the half — thanks to a 24-0 run powered by 5-of-6 shooting from 3-point range. The Cardinal extended its run to 27-0 at the start of the second half. The Wildcats eventually got more aggressive with the ball and even won the fourth quarter, outscoring Stanford 21-16, but it was too late to mount a comeback. It also didn’t help that Arizona was playing without Tee Tee Starks, who suffered a head injury during Friday’s game. While Starks wasn’t diagnosed with a concussion, Barnes said the forward was still dealing with headaches and would be resting the next few days. But the loss of one player provided an opportunity for others. Barnes gave minutes to players on the bench, like Bryce Nixon and Lindsey Malecha — neither of who played against California. Freshman Semaj Smith played 12 minutes. The third-year coach knows freshmen will make mistakes, but she hopes playing against teams like Stanford will help them improve . The Wildcats are now halfway through a stretch of playing four straight ranked opponents. While Sunday’s rout hurt Barnes a bit, she’s not too fazed. After all, it was against Stanford — which will likely make a run at the national championship. Arizona will play at No. 10 Oregon State on Friday and at No. 5 Oregon on Sunday. A single NFL season sounds like more trouble than it’s worth, but the increased national exposure for Tucson would be otherwise unachievable.